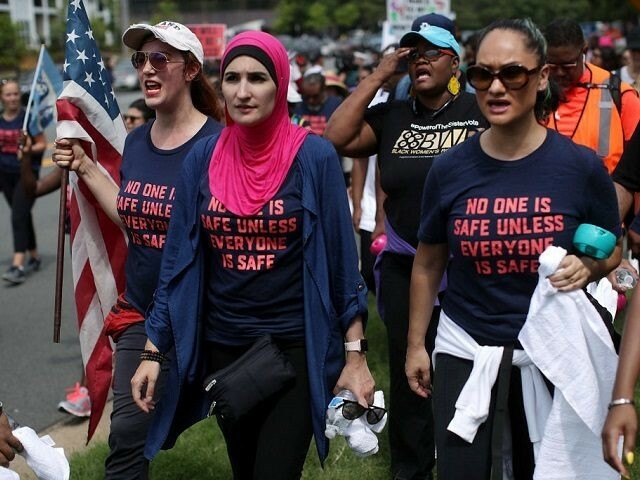 True to the left’s habit of having one set of standards for itself and another set for the common man, participants in Friday’s Women’s March against the NRA and gun rights were surrounded by armed guards. Ironically, one of the protest themes at the march was, “Real Men Don’t Need Guns,” which is lefty talk for disarming the public while making sure high-profile liberals continue to live ensconced behind layers of armed security. Leftist agitators like Linda Sarsour and Shannon Watts hiring armed protection while demanding the rest of us turn in our guns into government bureaucrats is nothing new. Watts does the same every time she shows up to protest at the NRA annual meeting. Former NYC Mayor Michael Bloomberg, who pays Watts millions to take away the Second Amendment rights of everyday Americans, doesn’t go anywhere without his security detail. On April 27, 2014, Breitbart News reported that Everytown for Gun Safety spokeswoman Erika Soto Lamb defended the fact that the group uses armed security while fighting to disarm average Americans. Lamb went on to suggest Everytown is not seeking a ban on guns altogether but limits on who can have them. She said, “As long as you’re not a felon, dangerously mentally ill or other prohibited purchaser, it’s all good.” But this is not an accurate statement, because Everytown and Moms Demand Action are both aligned against national concealed carry reciprocity for law-abiding citizens. If leftists would be honest, they would just come out and say they want to see the common man placed under strict controls while the ruling class gets to carry on with business as usual. In such a scenario the left could continue to move in and out of society under the constant watch of armed guards, all the while arguing–and even marching–for the disarmament of the common man.